Why Do Cats Have Whiskers? 4 Facts You need to know NOW! Have you ever experienced the tickle from your cat's whiskers as they brush against your neck or face? I have been tickled on several occasions by my cats as they are curling up on my shoulder to go to sleep or rub up against my body for attention. Have you ever thought about the reasons as to why do cats have whiskers?. Besides giving each cat their unique distinction, whiskers are a functional part of a cat. Filaments are a sensory system for cats made up of nerve endings that allow them to feel the lightest touch, even an air current. Cats are known to be farsighted, and they will use their whiskers to walk around in those areas that they are not able to see clearly. Even cats that are blind or have poor vision will rely more on their whiskers when they are moving. Cats which are born with their vision impaired will usually have longer hairs to help them to move around. If a cat were to lose its whiskers, they would more than likely bump into things. Those that are above the eyes protect the eyes from small particles. Cats lack eyebrows thus the only defense for their eyes are whiskers. In case one falls out, it will grow back soon. Some people are popular with the way they trim these whiskers down, but the eye of the cat then becomes vulnerable to infections and debris. If you notice a complication with the hairs, you may need to contact the vet to find out if it may be a disease or normal looking whiskers. Different types of cats have uniquely looking whiskers making it difficult for people to know an unaffected whisker and an affected whisker. The bottom and the rows of cats' whiskers usually move independently, which helps them to apply them as wind detectors as well as a locating the source of odors. They are also part of a system that enables cats to detect atmospheric weather changes that mean an earthquake or even a storm is heading its way. When it is chasing the prey in the dark, it depends on the whiskers to feel the movement of the air as their prey runs from them. These whiskers are known as feelers for cats. Their uses help the cat with very many different things. - Cat's whiskers also help keep a cat balanced. - Cats successfully express their moods using their hairs. When they are feeling cool and contented, they maintain their whiskers to the side of their face. When they are alert or intimidated, their whiskers will point forward. - There are other smaller whiskers located on her front limbs allow your cat to judge the location of the prey and its location. Some animal behaviorists assume cats have limited close up vision. Whiskers and an acute sense of smell would allow your cat to handle prey in close quarters. - Extending them outwards from the mouth while spreading them far apart- Your cat is calm and happy. - Bunching whiskers while flattening towards her face- your cat is frightened of something or shy. - Twitching the whiskers- your cat is looking out her surroundings for another animal or food. - Pulling them back tight along her face- is either feeling aggressive or unhappy. Whiskers are a very distinctive and beneficial characteristic of a cat. 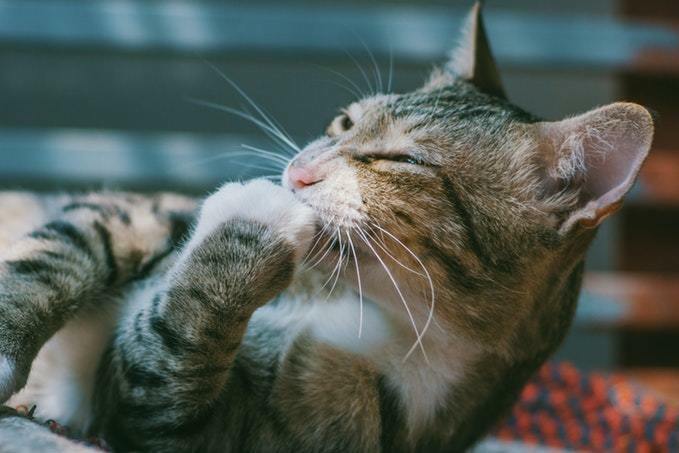 Now that we have known the reasons why do cats have whiskers, we should always take great care of them or leave these whiskers alone, as they are significant as their guide to moving around.